The wedding is the flagship ceremony of every culture. A deep awareness of the power of the wedding ceremony to change lives and perceptions contributes to the understanding of every kind of secular ceremony. understand all of the psychological and social dynamics of the journey to the wedding day through the various sub-rituals and the rehearsal. be able to ensure the freedom of choice for the client couple by having a wide knowledge of resources in poetry, prose, choreography, music, symbols and stories. In other words, the practical skills based on sound theory for the competent celebrant. The law is not a light for you or any man to see by;the law is not an instrument of any kind… (To the FOREMAN) The law is a causeway upon which, so long as he keeps to it, a citizen may walk safely. Robert Bolt in A Man for All Seasons. The whole scope on how the law operates in your country and the celebrants part in it. The place of law in society – how it regulates and influences; how it should not dominate a culture. 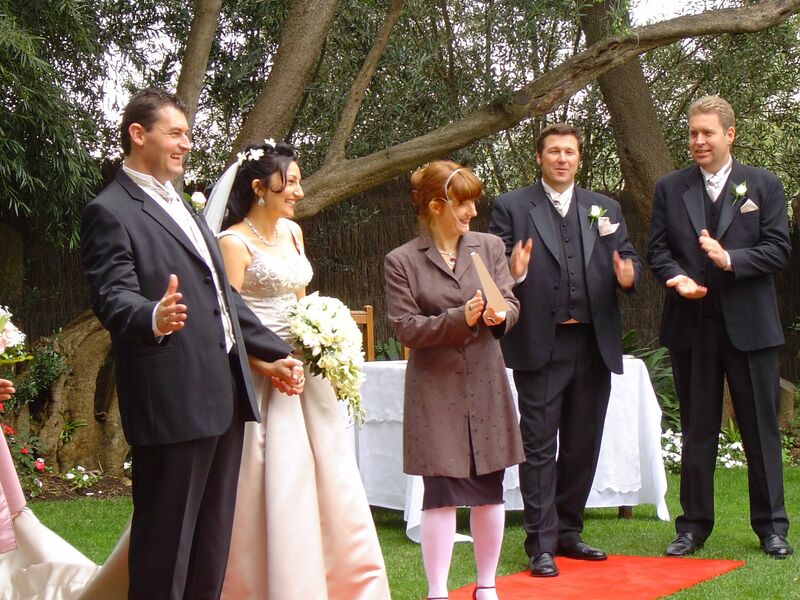 The parts of the law which affect the celebrant’s normal professional work, as well as the possibilities for changing the law for the better. The accepted conventions for the interpretation of the law; ways in which ignorance of the law and of its sensible interpretation can lead to unnecessary inconvenience. The ways in which the profession of celebrant is regulated from without and, to an extent, from within; and the role of a professional association. Assessment tasks are on the last few pages of the module manual. All assessment tasks are carefully read, critiqued and assessed by our Dean of Studies, Dr Chris Watson. Learning journal – a diary relating your studies to the world in which you live, includes compulsory research and writing tasks where necessary. Research questions – on selected writings of the marriage ceremony, which are included, and the legal forms. Fieldwork – a structured analysis of 3 different wedding ceremonies. 1. a structured interview with a celebrant. 2. an assignment on Relationship Education. The time envisioned for working on each unit is equivalent to 10 weeks at 8 hours per week. The College has not set dates for submission of individual items. 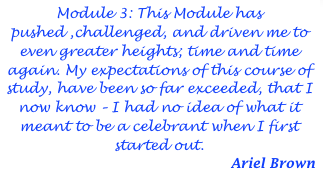 However, unless special permission to extend is granted, this module is to be completed within 6 months. Temporary suspensions of enrolment are negotiable, however fees for modules which have not been completed are not refundable. All manuals and DVDs are provided, including “Ceremonies and Celebrations” if not previously provided, and will be made available immediately, once the College receives full payment for the module. If the module manuals, books, DVDs and other items are downloaded from our website a discount will apply. Otherwise the items will be sent by post, airmail where necessary. Transferring any materiel belonging to the College to a third party without prior permission is unethical and strictly forbidden. Correspondence on administrative matters, including enrolments, are to be directed to the Registrar of Diplomas, Deborah Roffey. And if on matters concerning the module, enquiries are to be directed to the Dean of Studies, Dr Chris Watson.